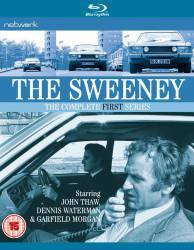 Continuity mistake: During the car chase when the camera is inside the Sweeney Granada, a green Fiat can be seen driving in the other direction. The shot immediately changes to outside the car and the Fiat has gone. Continuity mistake: When the squad car is on its way to Sussex to investigate the camper van, it is escorted by a police motorcyclist, but when the squad car arrives at the scene the police motorcyclist is already there and standing next to his bike. Continuity mistake: When Kibber, Oates and Finch are riding in the Ford Zephyr after swapping cars after walking over the railway bridge, they pass the same blue and red parked van twice, and also the same rubbish skip with the same cars parked behind it twice. Continuity mistake: The man who is robbed at the bookies arrives in a mauve Jaguar that he parks outside the shop, but a few moments earlier, when the robber is crossing the road to enter the shop, he passes the same mauve Jaguar, which is already parked outside the shop. Other mistake: During the hold up when Medhurst is sprung from the police van, the breakdown truck used to pull the doors of the van reverses towards the police van twice after releasing the chains off the doors before driving away, and the camera lights are reflected in the side of the white getaway car. Continuity mistake: When Regan and Carter are waiting for Cooney to pick them up in the car, look at the row of parked cars behind them when a truck passes between them and the camera. A Ford Capri suddenly appears parked behind the white Ford Anglia. Continuity mistake: When the squad are following Don on the motorbike in their white Ford Cortina they turn outside a shop called "Chelsea Typewriters". In the shots taken inside the car there is a white Riley parked between the red Fiat and silver Datsun, but in exterior shots there is a space where the Riley is parked. Character mistake: When Mrs Haldane is giving her statement to Regan she tells him that Cook was wearing dark glasses when she saw him outside her neighbour's house, but Cook wasn't wearing any glasses. Continuity mistake: When Cook throws "Uncle" down the stairs and then out the window the actor playing "Uncle" has so obviously been replaced by a stunt double who has more hair of a darker colour than the actor. Continuity mistake: The first scene when Steven and Arlene are in the office you can see a major road through the windows behind them. When the camera is on them in alternate shots the vehicles seen on the road in the first shots should been seen when the angle changes but are not. Visible crew/equipment: In the final scene when Daniels is helping Hargreaves into the car, camera lights and crew members are reflected in the side of the car. Continuity mistake: In the final scene, when Regan is mixing a drink while on the phone to Carter, he opens the fridge and pulls a green bottle out and puts it on the worktop. The scene cuts back to Carter, but when it cuts back to Regan the bottle has disappeared and Regan is pulling ice cubes out of an ice bucket that wasn't there before. Also another green bottle on the worktop has moved away from the wall. Other mistake: One of the bank robbers is Terry Wands but the opening credits bill him as Jimmy Wands. Continuity mistake: When Carter gets a puncture while driving the red van, as he gets out of the van there is a house on the opposite side of the road, but when the angle changes as Carter looks at the punctured wheel, the house is not there. Continuity mistake: When Regan arrives at the block of flats to speak to Biggleswade's parents, the squad car parks between a blue Ford Cortina and a white Fiat 128 parked a distance behind. In the next shot from the flats walkway looking down the white Fiat is parked right behind the squad car. Continuity mistake: Carter arrives at the hotel to tell Regan about Cook escaping. Regan introduces his girlfriend to Carter as Pat Knightly, but later on when Regan phones the hotel to ask to speak to Miss Knightly Carter asks "is that Pat's name, 'Knightly'?" Continuity mistake: In the final scene Regan hails a taxi as it pulls in the taxi is passed by a green Jaguar and a yellow Ford Transit.When the angle changes, these two vehicles should pass by, but they don't.Then when the taxi turns round and drives off, the vehicles in front of it should have been seen in the previous angle but they weren't. Factual error: When Carter is reading the newspaper there is no date on the front page. Visible crew/equipment: When Carter is chasing the teenager with the number plates, people standing around watching the filming can be seen in every shot.